Sooooo…one of the key values at LillaBlu (and for me, really) is transparency. It can be hard, especially when we don’t want to bother or burden others…or if we’re afraid to be seen…or worried about what others will think. 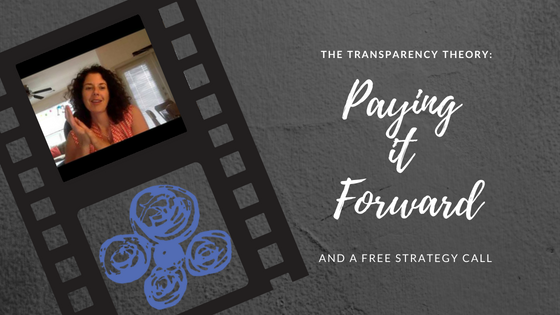 When I was trying to organize my thoughts to prep for a live video I did on my business page, I realized just saying I was grateful and wanting to pay it forward wasn’t really being transparent. And I would rather just tell you all the details in the first place and spare the vagueness. Many of you know I had a partial hysterectomy for some evil fibroids in July. What most of you don’t know is that while surgery went really well and I feel awesome (yay!) they found a pretty rare sarcoma making itself comfortable in my uterus. Considering my family history, cancer is something I don’t take too lightly…! My first CT scan was clear – nothing of concern. I’ll have them every 3 months for at least the next 5 years. The cells were contained in what they removed, margins on all sides. I’m having day surgery in a couple of weeks to remove my ovaries since this little bugger of cancer feeds on hormones and we really don’t want to invite it back. I’m feeling great, and the outlook is good! My family for the phone calls, texts, and visits checking up on me, driving me and the girls around, and taking a week night when they all had to work in the morning to drink lots of wine and process. Dad for his constant love and support, and taking me to that first appointment and his “You can handle anything” encouragement. My girls. Need I say more. Jason and his family for stepping in to help with camp stuff and scheduling when I was laid up briefly. Friends, who innocently were just checking in to see “what’s up” and got an unexpected download followed by an “I’m fine, though,” the wine, and the calls. Having the best medical resources so close by, and a team of specialists now on my case at Dana Farber and Brigham and Womens. Fantastic clients that were understanding and supportive through the summer. My LillaBlu team and Boldheart Business peeps who have been encouraging and loving me up…and working hard to keep things running. So, in a nutshell….I’m grateful. Thankful. Blessed. And I just wanted to share. Here is the link to the free strategy call offer I mention in the video above. If you’re in that place of overwhelm or just want some advice to see where you should be in your marketing, please fill out this short form! Click here for the Complimentary Call Request form.